Most of us are lucky to get through a single day of work while making sure nothing falls apart, burns down or falls over. Sometimes, however, inspiration strikes, and people go above and beyond the call of duty. You’ll know it when you see it—you walk into a store and see that someone has spent time and effort making things a little more visually interesting than is strictly required. Some of us have the urge to just stop and stare, and others have the urge to mess with the perfection. One way or another, it certainly draws your attention! #1 - Taste the rainbow. I’ve heard of a balanced diet, but this is ridiculous. There’s no practical reason for all of these drinks to be ordered by color and brightness, but it sure does make it look more enticing, doesn’t it? Whoever arranged this is very clever—it’s making me thirsty just looking at it. I’d have a hard time walking through this aisle without taking a bottle or two—very clever, anonymous stork clerk! #2 - Take a chair, any chair. See, this is why perfect sorting like this is a double-edged sword. 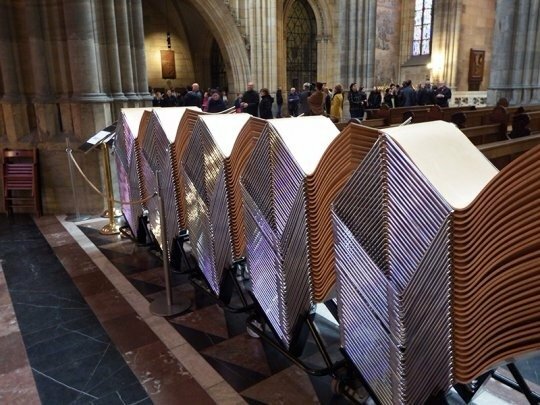 Sure, all that time spent preparing and stacking these chairs is great because now you’re sure to have enough chairs for everyone who might attend. But if you do get a bunch of people coming, they’re going to ruin your work by taking the chairs all willy-nilly! All that hard work for nothing in the end. #3 - Judging a book by it’s cover. 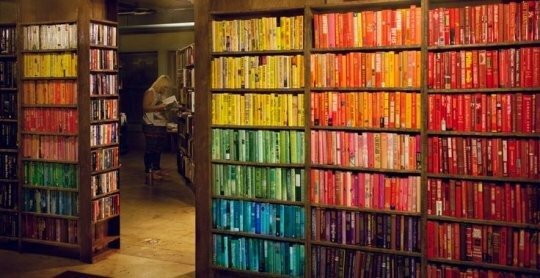 This may not be the quickest way to find the book you’re looking for—sorting by author, or title, or genre would speed up your time in the bookstore. 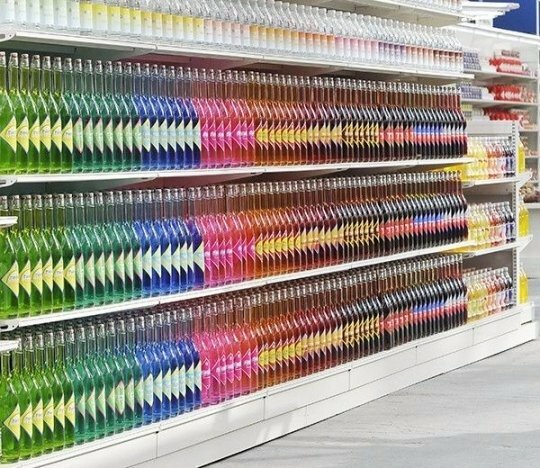 But why would you want to hurry through the store when it’s as perfectly arranged as this? I think my favorite genre of book is red. #4 - And a designer earned his paycheck that day. 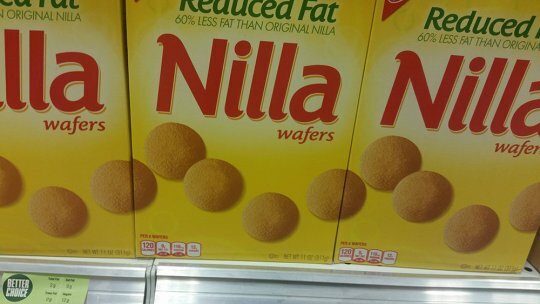 Sure, you’re likely to only have one box of these in your cabinet at any given time, but that’s not how they appear in the store—there will be rows and rows of boxes, all lined up. Someone here clearly thought ahead, and made the boxes so the pattern would go on and on. Quick thinking, that. #5 - Get it while it’s hot…or mild, or actively on fire. 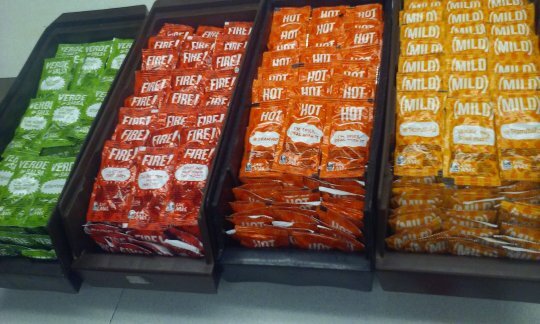 Here we have a rarity—sauce bins in perfect order. You just know that in about 30 seconds, someone’s going to reach their hand in and pull out a big heap of toppings, messing up the nice, easy to read labels forever. Ah well; it was nice while it lasted. #6 - I feel strangely compelled to look to the left. Who do you credit here? Probably not the designer, though it stacks just so perfectly. Credit the bored stiff clerk folding clothes, and noticing a pattern emerging. 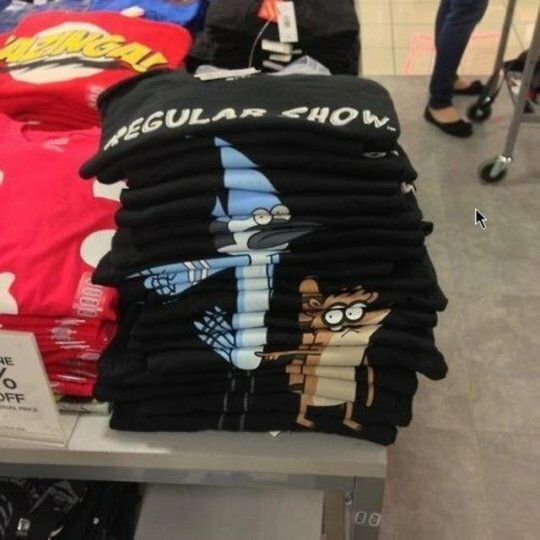 And even if you don’t want to buy one of these shirts and mess up the pattern, it’s pointing you to another stack you can grab from. That’s worth a raise. 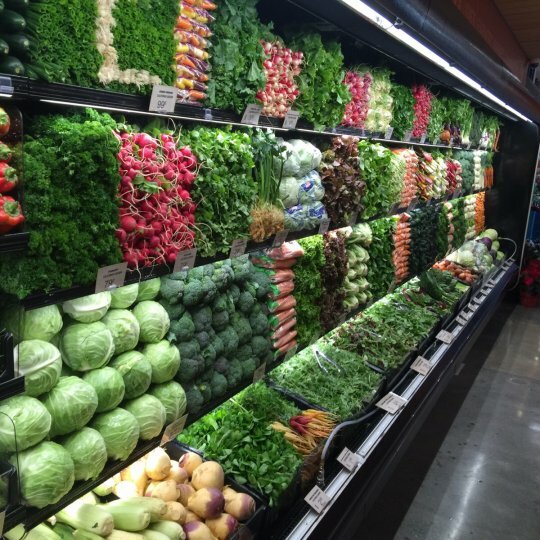 #7 - A wall of vegetables. This must be what grocery store employees do when the store’s closed. 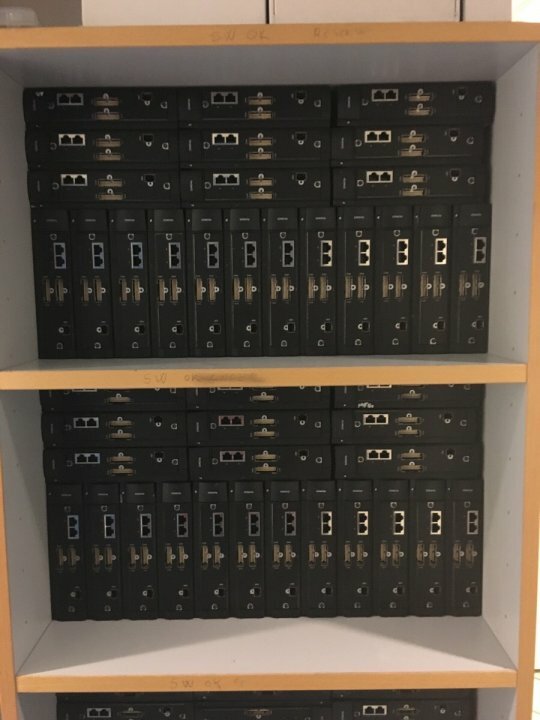 How else would they keep everything so perfectly stacked and organized? Maybe they have a camera pointed at it, and someone’s going to slip behind you and replace whatever cabbage or rutabaga you dare take from their perfect display. #8 - As the old saying goes, when life gives you oranges, make orangeade. So, you want to be like the people in this article. 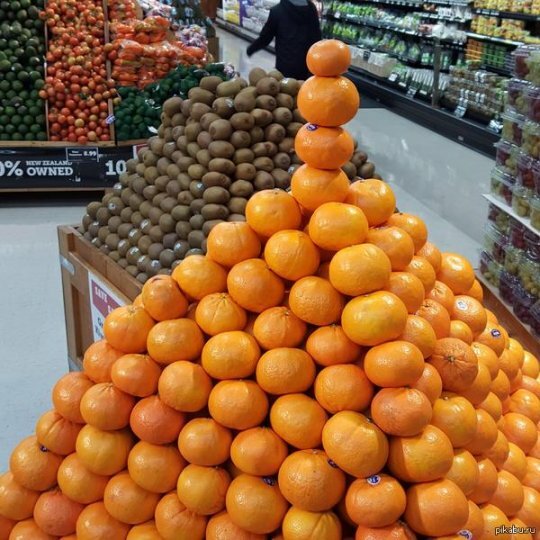 You spend a good hour making sure your orange display is perfectly stacked. You calculate just how many oranges you need on each level to have a perfect pyramid, and you painstakingly put everything in the right place. Then, your boss comes and tells you to add three more. Well, improvisation worked out alright here. #9 - Work smarter, not harder. You know how, when you were a kid, and your mom told you to sweep up, sometimes you’d peel back the rug and just sweep all the dust there? After all, out of sight, out of mind, right? 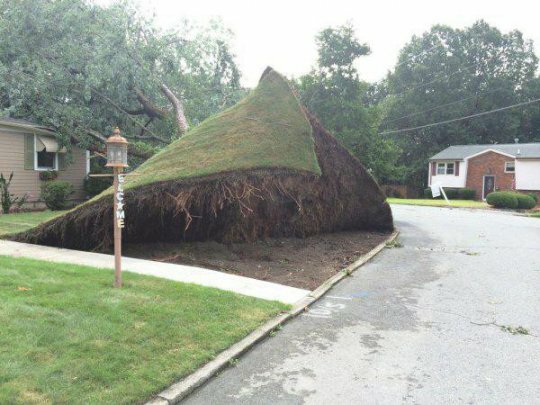 Something tells me there are some landscapers out there who never grew out of that mindset. #10 - You’ve got to look good in the big leagues! Speaking of landscapers, these guys are just slightly more professional. If you’re going to have your work broadcast on TV in front of millions of people, you’ve got to make sure you’re looking sharp. 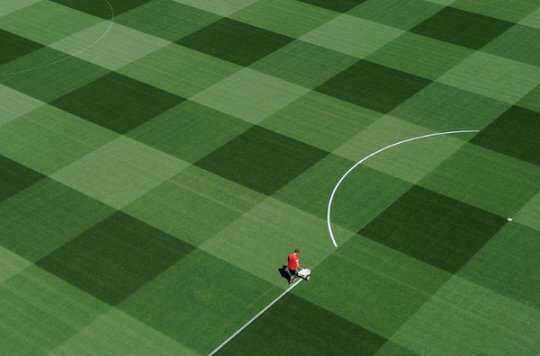 Sometimes, that means making grass so perfectly patterned that you could set your watch to it. #11 - Cut the blue wire. I’m lucky if I can keep my computer and mouse wires from getting tangled up, and there’re only four of those. A few zip-ties, a little inspiration and a whole lot of time on your hands, however, means that a professional can make a setup like this. #12 - A perfect fit. 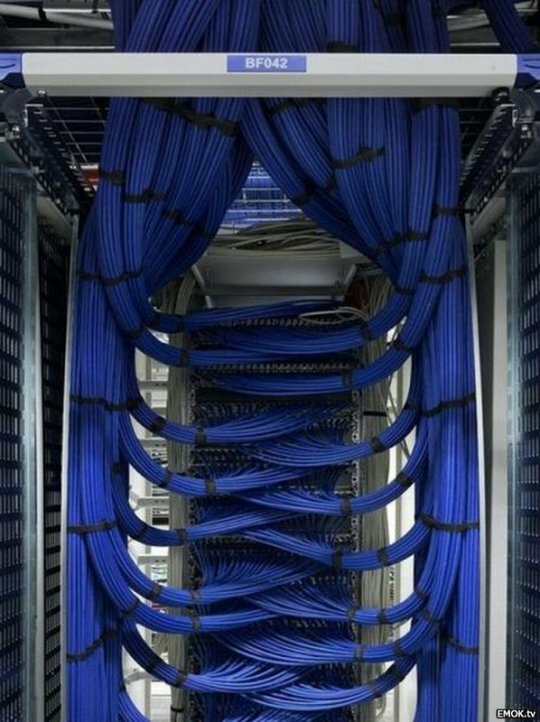 These guys must work with those blue wire guys—you couldn’t fit another server in here if your life depended on it. Nothing like a perfect snug fit to make your day complete.